That's right. Get at it. 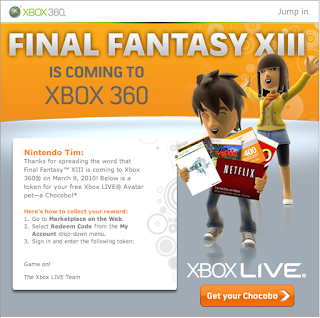 I just got the email to get my Chocobo pet for my 360 Avatar. It's been added to my que, but I haven't downloaded it yet. [UPDATE] I just let it download and applied it. A bit disappointing, I must say. I figured it would be a bit bigger than a chicken, as full-grown Chocobos...Chocoboes...Chocobi...whatever, are more prominent in the games than this. Considering the birds in Final Fantasy XIII are larger than they've ever been, you'd expect something with more value to it, but it's free, and when you have Square giving out free things, don't get your hopes up. Ever.